If I understand (and remember) correctly this painting didn't originally ‘hang’ (Sean didn't paint on canvas, he painted directly on the wall) in the Islay Hotel. It was on the wall of a garage/shed on Frederick Crescent. Roland got it from the owner and after restoring it put it on to one of the walls of the future restaurant of the hotel. The people in the picture are all local Port Ellen people, I believe several of them are still around. Having first planned to put a frame around it feedback from various people indicated this would be wrong, so now the border you can still see around the mural will just be painted. Ultimately it should look like Sean painted it on to the wall. This mural is huge and the small picture I can display here doesn't do it justice. 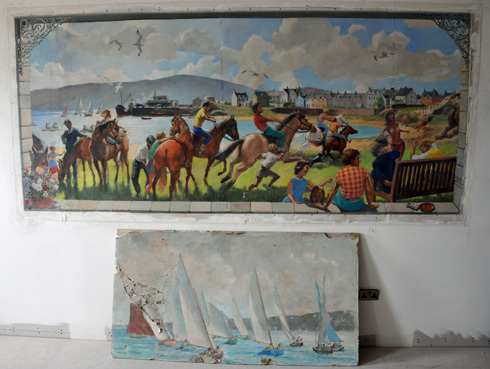 So here's a much much larger version of Sean O'Leary's mural painting. 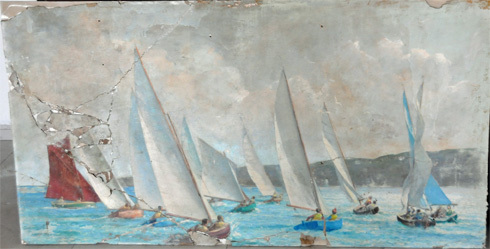 Again this one is damaged and will need some restauration work, but Roland is planning to get it up on a wall of the hotel at some point. I think many people will be looking forward to it. 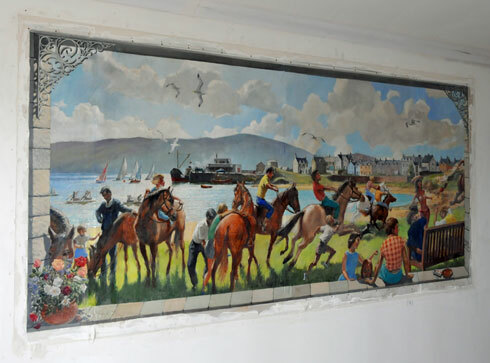 I don't know much more about the man or the paintings, a quite detailed attempt of an approach to Sean O'Leary can be found on The Local Legends Project with Painting Sean O'Leary – A Tribute to a Local Legend. I hope you've enjoyed the pictures, if you have any further information or any corrections to what I've written above please leave them in the comments. Thank you!